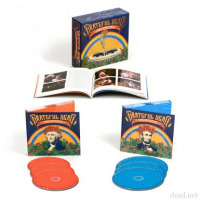 Set to be supplanted in 2012 by a new sequence of concert recordings dubbed Dave's Picks (overseen by chief archivist David Lemieux), The Grateful Dead's Road Trips archive series ends in stellar fashion with a complete show (plus), capturing the iconic band at one of the highest performing plateaus of its career in one of its favorite cities. Volume 4 Number 5 is a beautifully played and precisely recorded triple-disc set from The Boston Music Hall. The third show of the Dead's first lengthy jaunt since returning from its 1975 hiatus, there's a down-to-earth but nonetheless playful quality to this music. Erstwhile drummer Mickey Hart back in the fold, and he, in synch with rhythm partner Bill Kreutzmann, swing with understated panache through the nonchalant shuffle of "U.S. Blues." They then churn with a light touch within "Dancing in the Street." Few if any notes are wasted there or anyplace during the course of this June 1976 show (or the "filler" that completes the third CD in such rousing fashion). 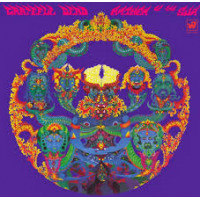 Tunes such as "Scarlet Begonias" begin tight and remain trim instrumentally and vocally; neither Donna Jean Godchaux nor Bob Weir}} had succumbed to the temptation to over-sing at this juncture, while titular leader Jerry Garcia is in fine fettle vocally too, as the vulnerability in his voice is equally effective on ballads such as "It Must Have Been the Roses" or his more stylized collaborations with lyricist Robert Hunter like "Crazy Fingers" and "Eyes of the World." Road Trips Vol. 4 Number 5, then, is a prime example of what wondrous sensation comes from just the right mix of material played with a commensurate sensitivity. Similarly, the packaging interweaves the correct portions of economy, color and insight. The graphics' red theme contrasts deliciously with its brown background, while the inclusion of vibrant stage photos are laid out in just such a way to prevent the text of Blair Jackson's essay from monopolizing the booklet. 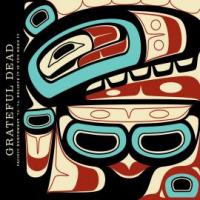 As with the other standout releases in the four-year history of this series, each element of design complements its surroundings, in a very real way, a microcosm of the Grateful Dead concert experience at its best. 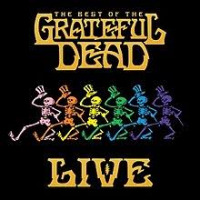 Track Listing: CD 1: Cold Rain and Snow; Cassidy; Scarlet Begonias; The Music Never Stopped; Crazy Fingers; Big River; They Love Each Other; Looks Like Rain; Ship Of Fools; Promised Land. CD 2: St. Stephen> Eyes of the World>Let It Grow; Brown-Eyed Women; Lazy Lightning>Supplication; High Time; Samson and Delilah; It Must Have Been The Roses. 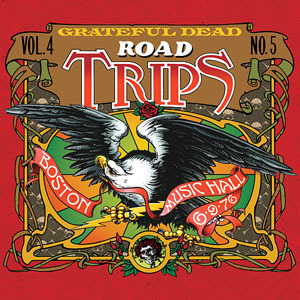 CD 3: Dancing In The Street>Wharf Rat>Around and Around; Franklin's Tower. Bonus tracks from 6/12/76; Mission In The Rain; The Wheel; Comes A Time; Sugar Magnolia>U.S. Blues>Sunshine Daydream. Personnel: Jerry Garcia: lead guitars, vocals; Bob Weir: rhythm guitar, vocals; Phil Lesh: electric bass; Keith Godchaux: keyboards; Donna Jean Godchaux: vocals; Mickey Hart: drums, percussion; Bill Kreutzmann: drums, percussion.